We trudged slowly back to the car through a crowded parking lot in the Texas summer heat. Hot, humid, full sun bearing down. I noticed my daughter matching my steps, walking close by my side the entire way back. Little legs stretching out as far as they could to match my stride. She smiled up at me and said, "Mom, look, I'm walking in your shade." She'd found the shadow, the safe place to walk. I loved that my side was her shield, giving her protection from the heat. We may not always see it, or feel it, we might forget it’s there at times, or even wonder if He's left us to fend for ourselves in the heat of hard situations of life. But His protection is real. He doesn't, He can't, forget us or ignore us. If we belong to Him, His love is too great to leave us on our own. Is it any coincidence that this is the 9-1-1 verse? In whatever troubles we face today, God is the place of refuge we can run to, He is our safe place. The word “dwell” used in this verse actually means, “to take up permanent residence in.” He reminds us to stay in His presence, for it’s a permanent place of living. His Word says if we do that, we will “rest” in the very "shadow of the Almighty." Shadows by definition are a place of protection or covering, they provide relief from the direct heat of the sun. If the heat is severe, the shade is the place we run to. It diminishes what we actually feel in the intensity of the heat. A reminder for us, especially in the tough stuff, that we never walk alone. Full heat of troubles bearing down hard, heavy, it’s a struggle at times to keep trudging through it all. Pressure and stress can seem as stifling as a hot afternoon summer sun. Yet God whispers truth, strong and sure, “Walk in my shadow, up close to my side.” It’s in the safe place that brings confidence; for when we are resting is God’s shadow, we will never face the full heat of our difficulties. He shelters from that pain. His shade, His shadow, diminishes what is actually felt in the intensity of all the heat. Rest, peace, and calm rise up strong, right in the struggling mess of life, and we’re assured, He's in control. Sometimes, maybe unintentionally, in the busyness or difficulties of living, we might strive to survive on our own. We forget that what we need most, God's protection and the comfort of His presence, are freely available to those who love Him and walk under His covering. 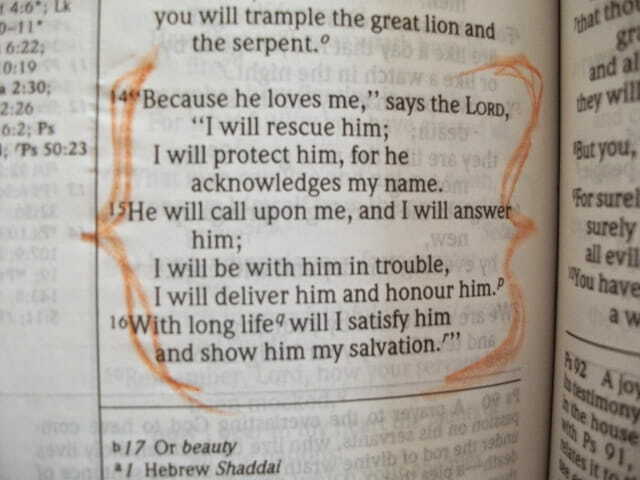 This entire chapter of Psalm 91 is filled with the goodness and power of God. Great reminders that He faithfully works on behalf of those who love Him. And at the end of it all, God gives 8 reasons of why we do not have to fear. There is great blessing as we seek after God, and choose to walk in His ways. In the midst of great darkness in this world, living in it all without His Truth and freedom, would be like wallowing in the pit. Not much hope to be found there. The truth is, this world has been dark for generations, since sin first entered the earth at the hiss of the enemy's lies. Yet God's reminders are sure, strong, and true, assuring us that in all that we walk through in this journey, His call is always to rise above. He reminds us we're not alone. And though He never says that we won't face hard times, He does say He'll be with us in it, rescuing us, and shining His favor over us. Don’t ever doubt it. God works on behalf of those who love Him and honor His name. He is so good to us. We may never fully know, this side of heaven, how very much He has sheltered us from in this life. "Dear God, Thank you for your presence with us, thank you for your Almighty Shadow. Thank you that you go before us, and cover us from behind. Thank you that you are in our midst, and that our future is secure in the place you're preparing for us. Your words bring such hope and comfort. Remind us of your strength today, may we see glimpses of your glory and blessing along the way as we seek after you. For victory and salvation are found in you alone. In the Mighty Name of Jesus, Amen." Find her also at http://twitter.com/debbmcdaniel and http://www.debbiemcdaniel.com. Some days can seem hurried, pressured, and tense. We know God’s truth, we believe His goodness, and yet we still find ourselves struggling, minds racing, before our feet even touch the floor in the morning. Our focus gets blurred. We start listening to the lies of other voices that do more harm than good. The constant media headlines tell us how dark and broken our world is. Images and reminders all around us shout that we’re “not enough.” The enemy’s great at heaping on guilt, condemnation, and fear. The problems we face seem more like giants of impossibility than anything good that God can ever bring from it. The truth is, some days we don’t feel like much of a strong warrior for God’s purposes. We just feel really weak. Afraid. Alone. Defeated. But often, out of His goodness and grace, when we find ourselves right smack in the middle of huge feelings of defeat, God shows up strong. Gideon certainly had no reason to feel strong, mighty, or anything like a warrior at that moment. He and his people were facing great suffering and defeat at the hand of the enemy. He doubted God was even with him. In fact, when the angel showed up, he was threshing his wheat in the pit of a winepress, not up on a hilltop where this was usually done. He was fearful and trying to keep hidden from view of the enemy who’d been raiding their land. Gideon questioned, "If God was with us, then why did this happen?" If God is really here, then why? If God is really good, then when? If God really cares, then how? I love how God is so gracious, patient, loving, and kind - even with the questions, even after His people had turned their backs on Him. God still sends an angel to encourage, to strengthen, to remind Gideon and all of the Israelites that He is surely with them. And yet even while staring straight into a heavenly messenger, Gideon continues to persist in defeated thoughts. He still questions, "But I am the weakest, I am the least...how can God save Israel?" Five powerful words. That can see us through anything we face in this life. God's Presence is real. He gives us strength for every day. The battle can be intense. And some days especially, the enemy seems really strong, and we feel really weary. We can find ourselves wrestling again with the same defeated thoughts that we thought we'd finally laid to rest just the night before. Disappointments come. We struggle with feeling like we haven't measured up, we listen to the lies that we are "less than..."
But God still answers us. Just like He did for Gideon. He sees "mighty" when we see "weak." He sees victory when we see defeat. He gives hope, when we're filled with disappointment. He's still with us, no matter how we might feel, or what struggles flood our thoughts. He is filling us with the power and grace of His Spirit, just enough for the day. 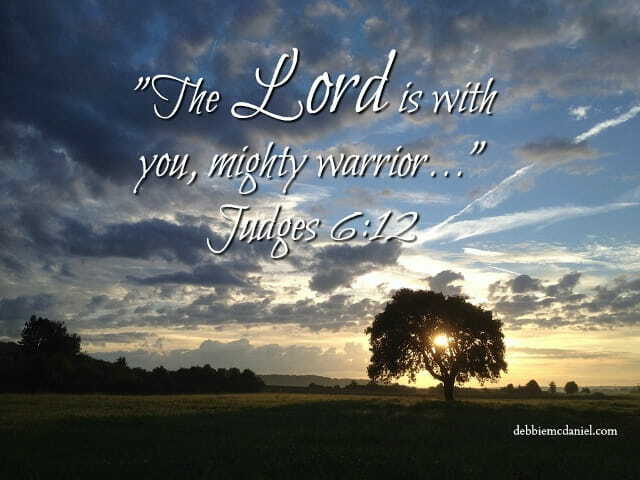 "The Lord is with you...mighty warrior." Debbie McDaniel is a writer, pastor's wife, mom to three amazing kids (and a lot of pets). Join her each morning on Fresh Day Ahead's facebook page,http://www.facebook.com/DebbieWebbMcDaniel, for daily encouragement in living strong, hope-filled lives. Find her also at http://www.debbiemcdaniel.com and http://twitter.com/debbmcdaniel.